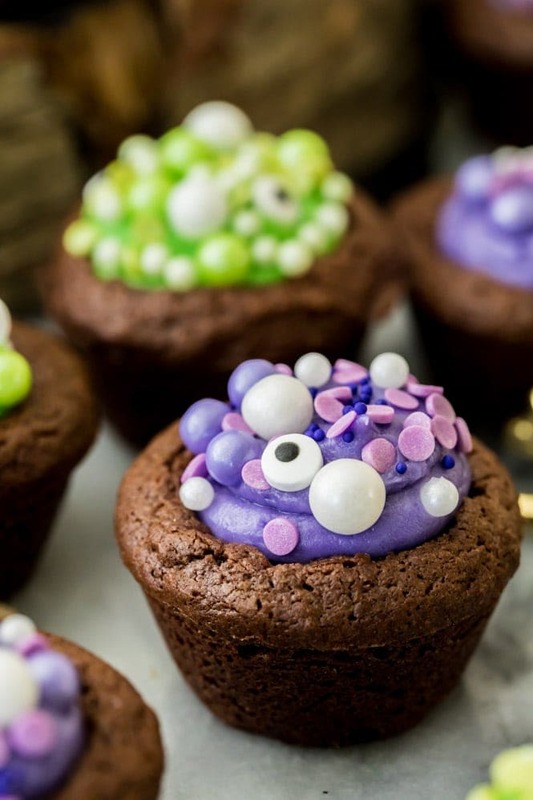 These Halloween brownie bites are a cute, spooky treat for your next Halloween party! Made completely from scratch with homemade brownies and a simple cream frosting! Be sure to scroll down to the bottom of the post to watch my video and see all my tips for making these sweet spooky treats! 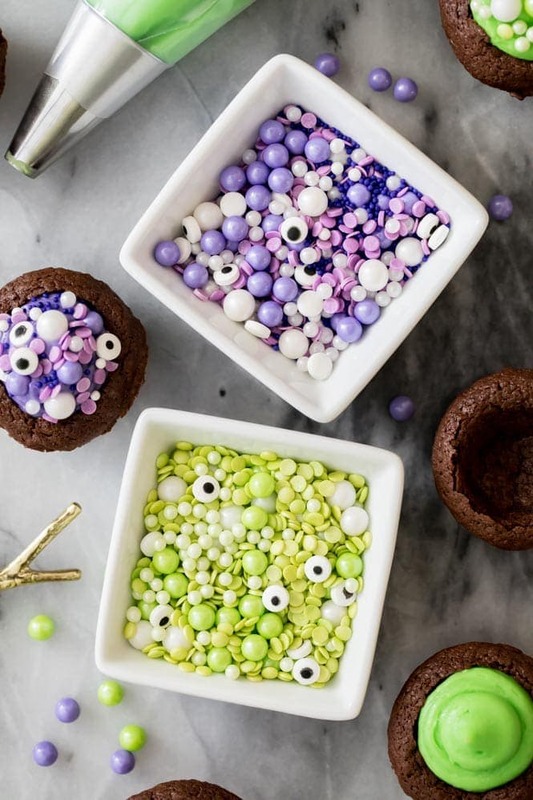 These Witch Cauldron Brownie Bites are a fun and easy Halloween dessert. They’re also just appropriately creepy enough that one of my siblings wouldn’t even eat them, but tasty enough that the rest of my family devoured them and asked for more. 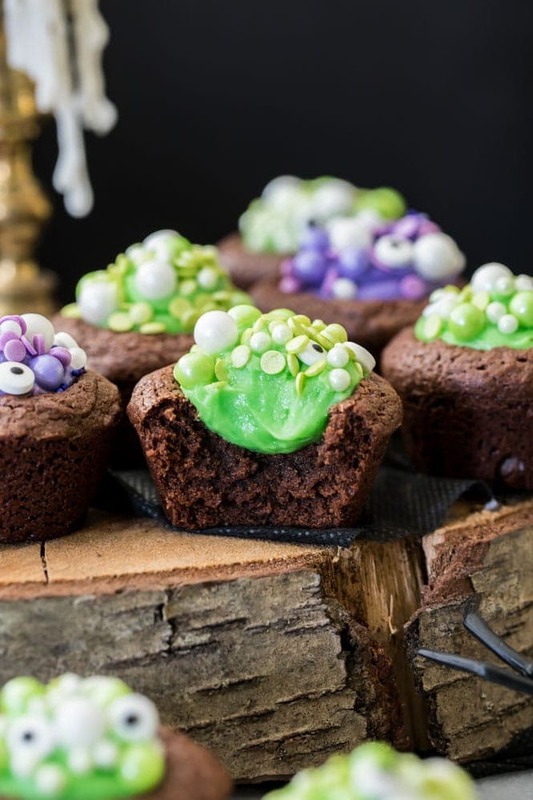 I was inspired to make these when I saw Brianne’s Witches Brew Halloween Cupcakes on Pinterest, and decided to make a mini version, only in brownie form! 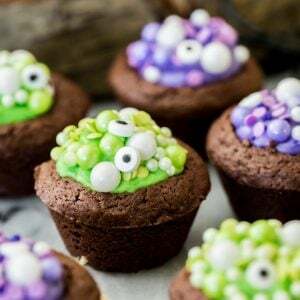 To make these Halloween desserts, I started with a super easy brownie batter (adapted from my homemade brownie recipe) that’s baked in a mini muffin tin. 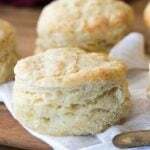 This is then filled with your favorite variety of frosting — I used cream cheese frosting for these because I find that it’s not overpoweringly sweet, but if you’re not a cream cheese fan you can use my vanilla frosting recipe instead. I am a sprinkles-addict and have at least 20 lbs of various sprinkles in my house at all times. I took full advantage of this for today’s recipe, but you do not have to go all out and buy all of the same sprinkles I used. Small candy eyes — I used Wilton brand and bought mine at Walmart, Amazon also sells them (affiliate) but I paid a fraction of the price at Walmart. The sugar pearls, nonpareils, and confetti sprinkles I purchased through Country Kitchen SweetArt’s online store, but the confetti sprinkles are also available at Walmart. If you can only buy two types of sprinkles, I’d recommend going with the confetti sprinkles and candy eyes, both of which should be available at Walmart, but feel free to play around and use your own favorite sprinkles! If you like Halloween Desserts, make sure to check out my Spooky Spider Cookies and my Ghost in the Graveyard Dessert Shooters, too! 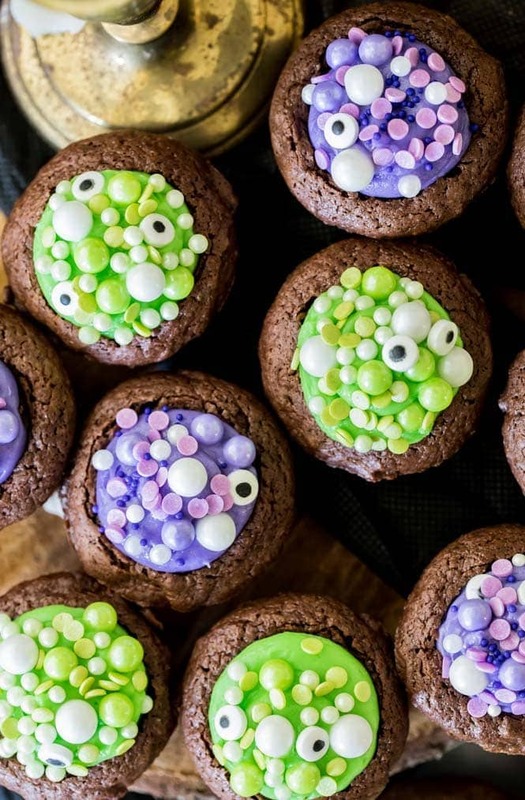 Spooky WITCH CAULDRON BROWNIE BITES! Be sure to check out my VIDEO at the bottom of the post, showing you step-by-step how I make these brownies! If you prefer a different kind of frosting other than cream cheese, check out my simple vanilla buttercream. Food coloring -- I used Americolor gel "mint green"*** and "regal purple"
Drop batter by 1 1/2 Tablespoon into prepared mini muffin tin (I like to use a cookie dough scoop to do this). Immediately take a rounded teaspoon or Tablespoon and press into each brownie bite to make a well (see photo in post for example). Allow brownies to cool completely before filling with frosting and decorating. While your brownie bites are cooling, prepare your frosting. 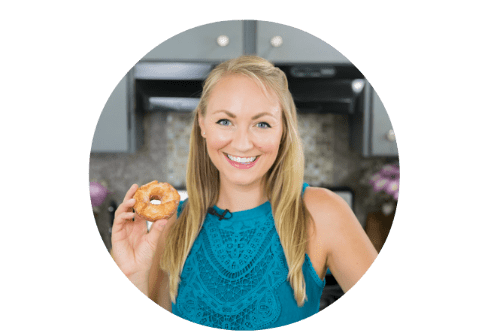 Combine butter and cream cheese in a large bowl and beat with an electric mixer until creamy, well-combined, and lump-free. Add vanilla extract and stir well to combine. If using just one color of frosting add it to your bowl until desired color intensity is reached (a little goes a long way with gel colorings! Start with less and add more as needed!). 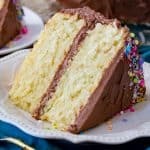 If using two colors, divide the frosting in half and mix the different colors in different bowls. Be sure to stir well so there are no streaks. Spoon or pipe frosting into completely cooled brownie bites and decorate using sprinkles. Serve and enjoy! *Baking spray is not the same as standard cooking spray. Baking spray should have flour listed in the ingredients, this will keep your brownies from sticking. I've found that if I use regular cooking spray I can't get my brownies out of the tin. 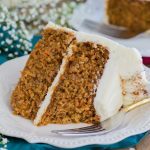 **I like to use my favorite cream cheese frosting for this recipe because it's not overpoweringly sweet. 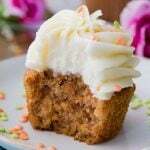 However, you can use my simple vanilla buttercream frosting instead, if you do not like cream cheese. 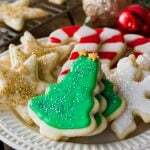 Just follow the instructions in that post to make the frosting and add food coloring as instructed here. ***Mint green will work fine on its own, but to make the color a little more neon and (in my opinion) "witchy", I also added a tiny drop of lemon yellow color, too. Don't rush out to buy it if you don't have it because it's such a subtle difference, but if you have the color on hand already you may want to try this! I made these for my kid’s Halloween party at school. 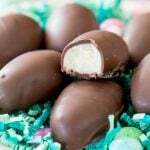 They were a huge hit! 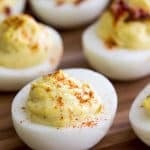 Your recipes are always consistently good! 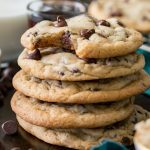 Do these brownie bites have issues with sticking to the pan? I’ve tried sooooo many recipes and they have always stuck to the pan. Excited to try this recipe. 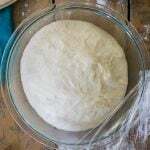 Use either a baking spray (not a cooking spray, make sure it says “baking” on it and make sure that it includes flour in the ingredients) and grease all of the muffin cavities well (I like to generously spray the pan and then go around with a paper towel to make sure each cup is well greased) or thoroughly grease and flour each cup. 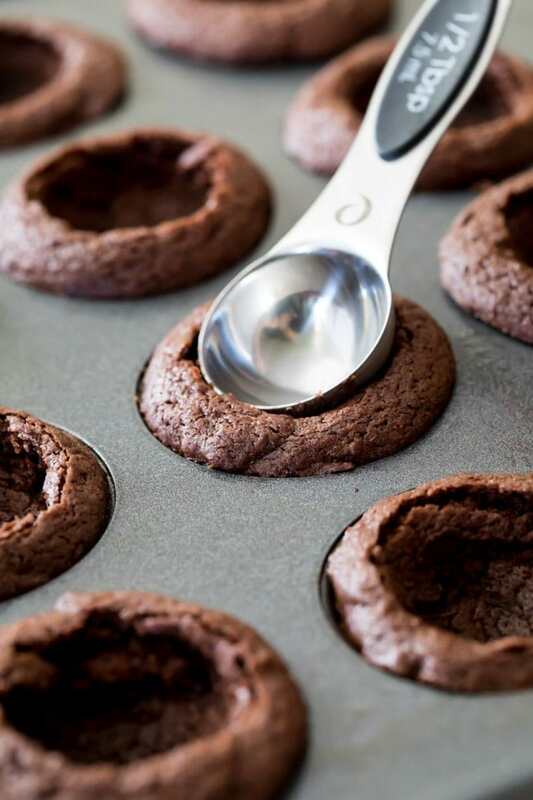 When you grease your muffin pan also make sure you grease a little around the top of each cup because if the brownie bite rises high enough it can get stuck there (that shouldn’t happen with this recipe, but it won’t hurt to do this anyway). 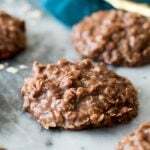 Also, when I’m removing my brownie bites from the pan, rather than try to lift them straight up, I wait for them to cool and then lightly grip the edges and twist them to loosen them from the pan and then pop them right up. That helps them come out more easily and they’re less likely to break than if you use a knife to pry them out.